London: Halal means ‘permissible’ in Arabic and is a term used to describe anything permitted under Islamic law as prescribed by the Qur’an. From travel agents and tour operators, banks and financial service providers, fashion, pharmaceutical, food, cosmetics, publishing, logistics and governmental organisations, there are ‘Halal’ elements to products and services in all these sectors. It is easy to underestimate the scale of the Halal market. The UK Halal market is today worth $4.5 billion and is expected to grow by 5 per cent each year until 2020. That makes it similar to the entire UK home takeaway food industry. To meet this growing demand, the number of vendors stocking Halal products, along with the range of products available, has boomed. Only five years ago, consumers could only choose from a limited variety of products available in select supermarkets. Today, major national grocery chains like Asda, Sainsburys and Tesco stock an ever-increasing variety of Halal-based products. This has also translated across into the high street via the catering sector, with restaurants and fast food outlets offering Halal options on their menus. Widespread Halal products and services, focused on ethical business, now cater to all aspects of Muslim life. For instance, over 20 fully Sharia compliant banks are licensed in Great Britain, offering a wide variety of financial services. Prospective property owners can circumvent interest rates by purchasing an Islamic mortgage, while the banks and financial services companies supplying the home loans and other products such as pensions and insurance do not invest their profits in gambling, alcohol or industries forbidden under Islam. Modest fashion is another rapidly expanding sector, with spending accounting for $44 billion globally. What is behind this exciting market growth? Firstly, the Muslim population in the UK has increased and with it, opportunities to market to a wider customer base. Indeed, more than 90 per cent of Muslim shoppers claim that their faith affects their consumption. Secondly the purchasing power of affluent Muslim millennials, who are willing to pay a premium for high quality& religiously observant products and services. Manufacturers, distributors and vendors all want to tap into this fast growing and lucrative sector. Whether an existing supplier looking to increase market share, or a new entrant, careful understanding and unique insight of the sector is needed, one that respects the traditions, values and preferences of the Muslim community. 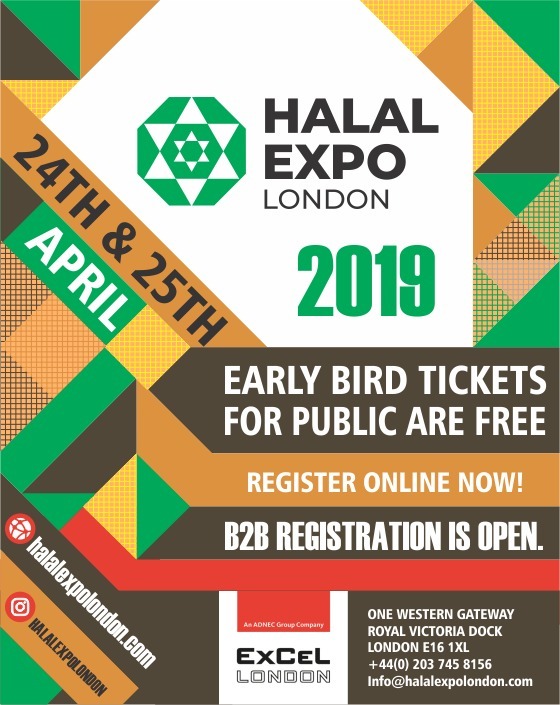 This is why the Halal Expo London exhibition has been created. On the 24th and 25th of April at the ExCeL London, senior buyers from a wide range of sectors will be at the exhibition to discover companies offering the latest products and services from all over the world for the market. The event will also feature industry-leading speakers who will provide unique insight into trends and the latest developments.